Movie Wizard is a free computer program for those computer users who want to watch their videos without being disturbed by the text and images located around the video. More specifically, the program “dims the light” so that you can see only the desired video and no additional content available on that web page. The Movie Wizard program is compatible with Internet Explorer, Google Chrome, and Mozilla Firefox, and works on YouTube and other video streaming websites. The program is presented at onlinemoviewizard.com, which is very similar to the official website of the software program named TV Time. These programs are identical and, at the same time, very similar to Blasteroids, Meteoroids, and some other free applications. The Movie Wizard program does not create any browser add-ons or extensions and is categorized as adware due to its capability to display third-party advertisements. We recommend that you remove Movie Wizard from the computer, because the interaction with pop-ups, interstitial advertisements, in-line ads, and other types of advertisements may result in your suffering from data loss or some system performance-related issues. Movie Wizard is not related to the websites promoted and has no control over the activities of the websites advertised. 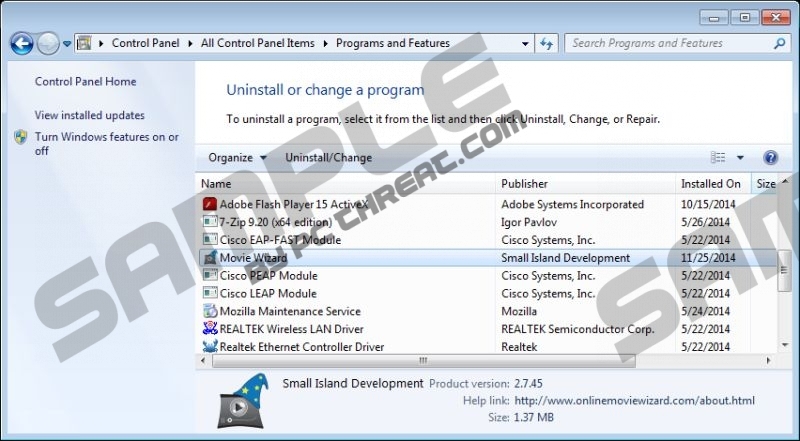 By installing this program, you agree to be provided with various advertisements, some of which may promote fake system scanners or updates for your Internet browsers or other software programs. A single click may inflict serious damage to your operating system or have a negative effect on your privacy; hence, we recommend that you remove Movie Wizard from your computer as soon as you can. Movie Wizard automatically collects information about your interaction with their product and your browsing behavior. The information being collected includes IP address, clicks, browsing history, time spent on various websites, and other anonymous information. This information is collected for a variety of purposes that are related to the improvement of the service and your experience when using the Movie Wizard program. If you want to avoid encountering programs such as Movie Wizard, you should pay more attention to the programs you want to install. Movie Wizard is developed by Small Island Development, which is also known as Time Lapse Solutions and Solutions, and can be bundled with other freeware, including media players, browser add-ons, and system optimization programs. It is much better to prevent the installation in the first place than try to remove the unwanted program when it has already caused some damage. So, if you want to remove Movie Wizard and shield your system from unreliable programs, implement SpyHunter. This malware and spyware removal program provides real-time protection against ransomware infections, Trojan horses, adware programs, and many other programs created to compromise the operating system and help the attackers implement their plans. In case you are determined to remove Movie Wizard manually, use the following instructions, but do not forget to scan the system afterwards. Uninstall the Movie Wizard program. Click on Movie Wizard and click the Remove button. Quick & tested solution for Movie Wizard removal.